WW1 Reenactments Equipment : Great War Tommy WW1 Food Rations Labels : Australian Camp Pie, 1916. WW1 Reproductions and WW1 Reenactors Equipment / Kit - Australian Camp Pie, 1916. 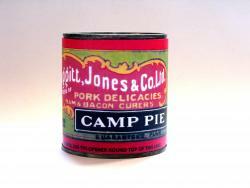 Canned "Camp Pie" (period name for Luncheon Meat) produced by Foggitt, Jones & Co, Ltd, (1908) Ham & Bacon curers of Brisbane, Queensland, and supplied to Australian troops.